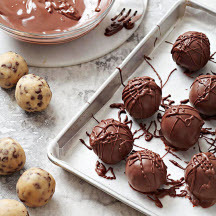 These easy treats look like fancy chocolate truffles, but they're really just chocolate chip cookie dough in delicious disguise. Don't be tempted to substitute another chocolate chip cookie dough. This simple recipe is eggless to keep the raw cookie dough food safe. Meanwhile, in a small saucepan heat chopped chocolate, candy coating, and shortening over low heat, stirring until until melted and smooth. Remove from heat. Using a fork, dip balls into chocolate mixture, allowing excess chocolate mixture to drip back into saucepan. Place dipped balls on the prepared baking sheet. Let stand or chill about 30 minutes or until set. Lightly drizzle with the remaining melted chocolate mixture. Makes 20 truffle cookie treats. To Store: Place truffles in a single layer in an airtight container; cover. Store in the refrigerator for up to 1 week. Nutritional Information Per Serving (1/20 of recipe): 198 kcal cal., 11g fat (7g sat. fat, 0g polyunsaturated fat, 2g monounsatured fat), 9mg chol., 24mg sodium, 23g carb., 1g fiber, 13g sugar, 2g protein. Recipe and photograph provided by Better Homes and Gardens - BHG.com a member of the Home and Family Network for the best of cooking, gardening, decorating and more. © Meredith Corporation. All Rights Reserved.